To test the feasibility of using a small unmanned aerial system (sUAS, or “drone”) as a tool for North Carolina Department of Transportation bridge inspections, Alpha & Omega Group piloted a mission over the Manns Harbor Bridge, a three-mile structure spanning the Croatan Sound near Manteo, NC. The two-person team made the flights on May 17 and May 18, 2017, during an NCDOT-assigned, National Bridge Inspection Standards routine inspection we were already conducting. Taking advantage of traffic control already in place, the team operated from a “pull-off” area on the main span, using it as a take-off and landing platform. We used mission-planning software to pre-program the horizontal flight over five spans of the bridge, which calculated the sequence of photos for photogrammetric model creation. Later, we “manually” piloted the aircraft to fly under the bridge, circling and photographing bent 138. 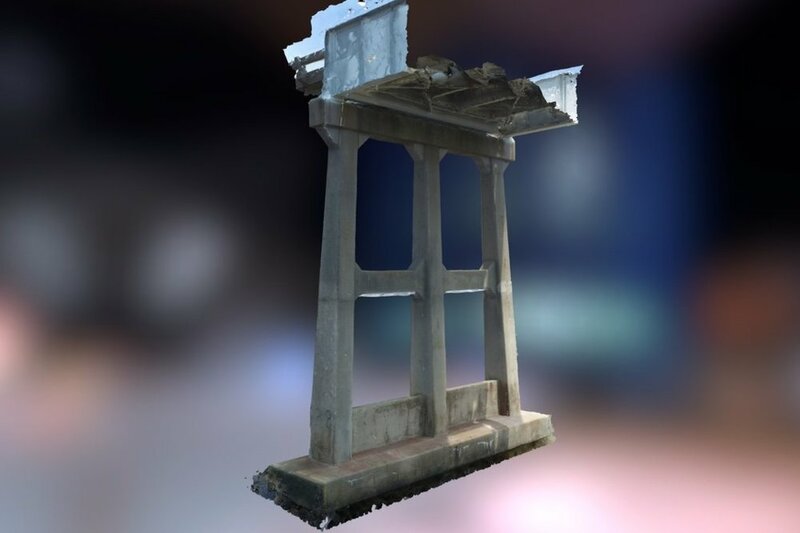 The photos were used to create a three-dimensional model showing the capability of the aircraft and camera to document structural defects in the bridge. A&O produced a report for NCDOT describing the success of the test, along with areas to be developed or tested further.